Have a hug. Read Atlas Shrugged. 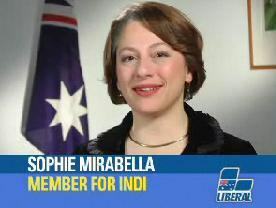 My interview with Australian free market politician, Sophie (Panopoulos) Mirabella (Liberal Party of Australia) is now online HERE. Sophie has been presented with the Celebrate Capitalism™ campaign’s Annual International Capitalism Award, Melbourne 2008. The PRODOS blog » Blog Archive » Welcome to the Universe Alexandra! Dr Ben Carson wrong about Lenin quote? If Obama had an Egyptian belly-dancer she’d call him a jerk. In Arabic. USA: Based on U6 real unemployment rate is 14 percent but what is the “real” rate? Michael Yon: Obama is a racist. Trayvon Martin old enough to join the Marines. Was Trayvon Martin denied a “jury of his peers” as Jesse Jackson states? realist on Are Blacks genetically LOWER in intelligence and HIGHER in psychopathy than Whites? PRODOS on Are Blacks genetically LOWER in intelligence and HIGHER in psychopathy than Whites? BobbyD on Are Blacks genetically LOWER in intelligence and HIGHER in psychopathy than Whites?